On Checkout 51’s list this week (Sept 12-18, 2013) is Opti-Free contact lens solution, Any variety. OPTI-FREE® EXPRESS® MPDS solution keeps your lenses feeling comfortable all day by helping to retain moisture and prevent the build up of proteins. The powerful combination of Citrate, Tetronic® 1304* and AMP-95* lets your lenses clean and condition themselves while in your lens case. Each key ingredient does its own special job. Citrate pulls protein away from your lenses. Tetronic® 1304 removes dirt, lipids and debris. And AMP-95 repels proteins, shielding your lenses from buildup. The result? Lasting all-day comfort. Your eyes stay fresh and energized from morning to night. You will get $2.00 cashback rebate at Checkout 51. Here’s a pic of what it looks like. I found a couple prices of it at a few stores. 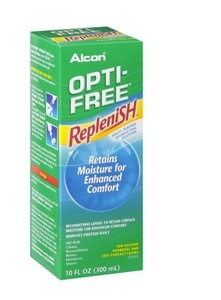 You can find Opti-Free contact lens solution in any Shoppers Drugmart, Rexall, Loblaws and more. I didn’t find any Opti-Free coupons to use.